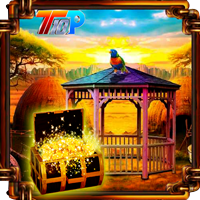 Top10 Find The Golden Box is another point & click escape game developed by Top10NewGames. Assume that your golden box was hidden by your friend. Now you are going to retrieve it by using a key, objects, hints and by solving puzzles. We hope you will find your golden box. Good luck and have fun! Use compass on tree far right scene as clue for bee direction puzzle. 12 o'clock = 1, so 3 = 2 clicks. Then choose opposite direction (starts at South). This is to all the people who post negative about easy games "not this game' We rate them high because it is sometimes nice to relax after a HARD game,also GFG for example lets me spend time with me granddaughter and teach her the JOY of escape games,sometimes she gets it before I do. Little rant over.